The runtime information in the report is taken from the uncut version. This comparison is between the cut VHS tape from Warner Home Video (BBFC PG) and the uncut DVD (BBFC 12), represented by the German DVD. Getting more and more senile, the loveable Commander Lassard starts a program titled 'Citizens on Patrol' ('C.O.P.') which is supposed to enhance the relation between civilians and the police and eventually lead to a more active fight against crime by the local people. 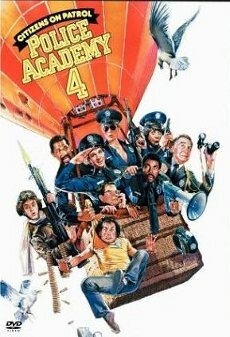 Lassard himself going abroad to present his program, he is substituted by Captain Harris who is completely opposed to this (in his opinion completely idiotic) program and tries to sabotage it with the help of his dull assistant Proctor. But when a group of inmates escapes jail, the C.O.P.s together with Mahoney and his pals can show their qualities. 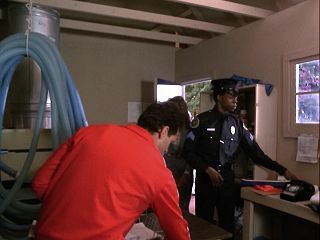 Police Academy 4 - Citizens on Patrol (1987) might be the last acceptable chapter in the popular and successful 'Police Academy' franchise (7 Movies, from 1984-1994), which had to suffer a giant loss in terms of quality after 'Carey Mahoney' Steve Guttenberg had left, leading to downright uncreative and worse sequels. Even this one already was on its way from comedy to slapstick, but still can entertain its fans with a reasonable amount of gags which don't always hit the punchline, but are nonetheless entertaining throughout the movie's runtime. Along with that, this movie features almost all of the original protagonists for a last time (including 'Captain Harris' G.W. Bailey) with all their flaws and trademark behavior. Fans of the three prequels are likely to enjoy this one, too! 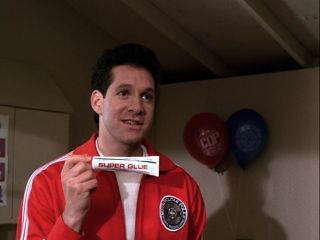 Although the movie had been released uncut in British cinemas, the scene in which Mahoney is visibly holding to the camera and opening the super glue was cut out for the BBFC 6 VHS tape release. 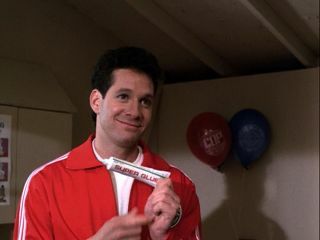 The following scene in which he applies the glue to Captain Harris' megaphone wasn't touched at all. Presumably all children under 12 should not get the idea that this was actual glue to prevent them from re-enacting such stuff. Due to its higher rating, the BBFC 12 DVD is uncut. Note: Any runtime difference (less than 0.5 seconds) caused by faulty master tape, jump cuts, or similar reasons have not been included in this report, but may occur. Mattson enters the room and asks Mahoney what he is looking for. 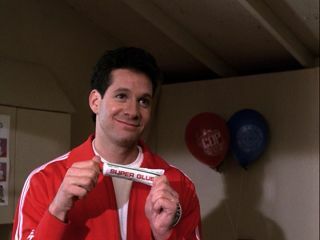 Mahoney lifts up the 'Super Glue' tube and opens it.